Mirjam van Reisen is Professor of International Social Responsibility at Tilburg University in the Netherlands. She is the founder and director of Europe External Policy Advisors (EEPA), a group of experts on Europe’s relations with developing countries, based in Brussels, Belgium, and is a member of the coordinating committee of Social Watch. The African, Caribbean and Pacific Group of States has emerged out of a unique relationship with the European Union. While the EU needs the ACP’s raw materials and markets, and backing to get support in international governance, the EU is indecisive about continuing this special relationship. The ACP represents almost half the world’s states but does not have a voice in global governance forums, such as the Group of Twenty (G-20), which exclude the poorest countries. The ACP is re-evaluating its partnership with the EU and exploring new opportunities with emerging countries. The EU must decide whether it wants to build a partnership with ACP countries on equal terms. Globalization has made the world more interdependent than ever before. Problems are no longer the responsibility of the few. Whether the global financial crisis, climate change, human security or rising food prices, no country is exempt from the impact of these problems. But not all countries are equally influential in the global institutions that address these problems. Think of the Group of Twenty (G-20), the International Monetary Fund (IMF) and the United Nations (UN) Security Council. Each of these institutions dances to the tune of the major world powers. The African, Caribbean, Pacific Group of States (ACP), on the other hand – the obvious representative of the world’s poor, marginalized countries – barely has a say in such global institutions and hence little influence in global governance. How, then, is the ACP going to claim the position it should rightly have in global governance, as a bloc representing almost half of the world’s nations? This is not about border conflicts or military tensions. Those problems fall under the domain of the African Union and the Unions of Caribbean and Pacific States. The ACP is well placed to make its voice heard in international governance issues such as climate change, finance or trade. It can take advantage of its members’ diversity and the clout of its larger ones, such as South Africa. The ACP could further strengthen itself as a group through South-South economic linking, investing in high-quality products and creating added value for its exports. The ACP supplies essential raw materials, not only to Europe but also to emerging economies. It therefore has the potential to become a bloc of countries that global institutions feel they must reckon with. The first step towards securing a voice for itself as a group entails re-evaluating its partnerships. The ACP signed a treaty, the Cotonou Agreement, in Benin in 2000 with one of its traditional partners, the EU. This treaty is due to expire in 2020, however, and the EU has not yet confirmed it will renew the agreement. The ACP, meanwhile, has begun to flirt with other potential partners, including China and the other BRIC countries (Brazil, Russia and India). Whichever partnerships the ACP considers, the ACP-EU relationship is at a crossroads. More than ever, the ACP seems to be in a position to choose a path that will strengthen it as a group and enable it to become an even more viable force in the global arena. In a seventies-style building in Brussels, just outside the neighbourhood where EU institutions are housed, dozens of colourfully dressed ambassadors meet regularly at a table some 30 metres long. The ACP diplomats discuss trade agreements with the EU. Some speak in English, some in French. Interpreters in soundproof boxes provide simultaneous translations. The diplomats discuss commodities such as sugar, coffee, cotton and other goods, worth billions of euros in trade. Their talks affect the livelihoods of 1.3 billion people: 792 million in ACP countries and 501.1 million in the EU. For years, Europe has regarded Africa as its back garden. Colonial powers went in and took Africa’s resources. In postcolonial times, Europe and Africa negotiated trade deals for fuel, cotton, coffee and other goods. Now, Europe needs Africa more than ever, especially with a booming commodity market. But does Africa still need Europe? For some, free trade is the answer to the ACP’s problems. Indeed, it can eradicate poverty, according to Desai. He sees the WTO as the only global institution where all states are equal. ‘No permanent members, no veto powers. And free trade is necessary for every country to develop,’ he told ambassadors from ACP countries at a presentation in Brussels in June 2011. ‘Development doesn’t come from granting special status. It doesn’t come from requesting your money back from former colonial powers. Development comes from hard work, high savings and free trade.’ Desai favours realpolitik over idealism, and emphasizes that the participation of all countries in decision-making processes is an essential condition for global governance. Free trade was the idea that underpinned the EU’s proposal to the ACP in 1998 that eventually led to the agreement in the Cotonou Agreement to negotiate EPAs. Stiglitz warned against bilateral investment agreements, such as the EPAs; does this also warrant a closer look at the EPAs, and which countries or blocs benefited from these? And what is the EU’s stance on the matter? The EU has been negotiating trade deals with the ACP since it was founded in 1975. In 2000, the parties even agreed to abolish non-reciprocal trade preferences after a transition period of ACP-EU trade cooperation. The Cotonou Agreement is a unique partnership, legally binding and based on equality and mutual respect. However, this form of cooperation between the EU and the ACP is now on shaky ground. ACP diplomats are rightly concerned. The EU’s interest in cooperating with the ACP seems to be waning, and the question is whether the EU intends to prolong it after 2020. The European External Action Service (EEAS), launched in December 2010 and headed by Baroness Catherine Ashton, does not have an ACP division. To make things worse, the ACP is not mentioned any more in the EU Lisbon Treaty (see box, page 9)), which was meant to herald a new era in external relations and development cooperation in the EU. The EEAS’s administrative set-up does not recognize the special status of the European Development Fund (EDF), which funds ACP-EU cooperation. The negotiations on EPAs, moreover, have been cumbersome since the Cotonou Agreement was signed. The EU and the ACP had agreed in 2000 to discuss more free trade. The idea was to conclude bilateral agreements between the EU and ACP countries. But the expected effects of the proposed liberalization on ACP countries appeared negative for many of the developing countries. Moreover, the architecture of the negotiations was also too difficult: the EU chose to negotiate with regional groups of ACP states, but these groups differed internally. The EPA negotiations came to a slow-down in 2009. ‘Some of the most important issues that concern the ACP group,’ according to ambassador Sooklal, ‘are the EDF process and EEAS’ new structure. These are signals to the group saying that Europe is not giving them the same level of attention as previously.’ The EU’s problem is that it feels locked in its historic relations with the ACP, whereas what it really wants is to remodel its international cooperation framework so that it is pertinent to today’s problems. The EU lacks the imagination needed to recognize the potential its partnership with the ACP has in today’s world. It is no surprise, then, that ACP diplomats are puzzled that their group is not mentioned in the Lisbon Treaty. Zimbabwe’s new ambassador to the EU, Mary Margaret Muchada, compares the situation to a personal relationship. ‘If your boyfriend keeps mum about the relationship after 2020 and doesn’t mention us in the treaty, no wonder we are looking for new boyfriends,’ she says, explicitly naming China as Europe’s competitor. The ACP countries, meanwhile, are warning the EU that negotiating and ratifying new agreements are likely to take years. It is therefore essential that a swift decision is made on when to start negotiations. In addition, the ACP will not, and should not, depend on the EU to take the initiative to decide where the partnership will go next. So, what is the future, if any, of ACP-EU cooperation? ACP ministers have been deliberating on how to strengthen the group’s unity and solidarity. In 2014, the presidents and other rulers of ACP countries will meet and decide on their future position. After that, they propose to meet jointly with the heads of the EU member states at a summit to agree on the shape of the ACP-EU partnership. A crucial decision will need to be taken on the future of the Cotonou Agreement now that the EU is preparing to negotiate the union’s budget for the next seven years (the next Multiannual Financing Framework). This budget concerns hundreds of billions of euros. If the agreement is not continued, the EDF’s financial support would eventually be integrated into the EU’s overall budget (see box, page 10). The ACP-EU partnership has hardly helped developing countries to grow over the past two decades. The ACP’s share in world trade even diminished during this period, says Patricia Francis, executive director of the International Trade Centre (ITC). Every day, people worldwide use sugar, drink coffee, buy cotton clothes or even fill their tanks with fuel originating in Africa, the Caribbean or the Pacific. But producers in ACP countries have hardly added value to the products they sell in the last few decades. The EU used to be able to count on the ACP vote in international negotiations, but no longer. Why is this the case? Did negotiations between the ACP and the EU on the EPAs mortgage the relationship that once used to be so evident? The Cotonou Agreement was meant to help trade between the EU and the ACP. The two blocs decided to conclude a new trade regime, the EPAs, intended to establish reciprocal free-trade agreements between the EU and ACP sub-regions. The EU emphasized the need for compliance with the WTO, requiring the liberalization of at least 80% of ACP trade (by tariff lines and trade volume) in order to be ‘WTO-compatible’. The EPA negotiations turned out to be very difficult. In fact, they alienated some ACP countries from the EU, while the intention had been to strengthen the relationship. In the end, the ACP remained a substantially united bloc of countries – out of the group’s 79 countries only 25 signed the agreements, mostly small Caribbean states. In the negotiations with Namibia, the commissioner of trade, De Gulch, subsequently promised ‘to back off on EPAs’ after the concerns that had been raised. Nevertheless, in January 2011, the ACP Council of Ministers still complained that ‘EC negotiators have continued to exert severe pressure on ACP States to sign up to agreements that do not fully reflect their concerns.’ Many commentators and researchers have argued that the EU had emphasized free trade more than necessary in order to gain greater access to ACP markets, including in the areas of investment, services and government procurement – areas of considerable interest to European companies. Critics have claimed that the vulnerable ACP economies have been asked to liberalize much more than the EU, and that this contradicts the WTO regime, which is based on the principle of preferential treatment for weaker economies. In 2001, the ACP opened an office in Geneva, illustrating the relevance of defending the interests of the group in the WTO. ACP countries have doubted whether the EPAs would serve their interests. The problems raised repeatedly throughout the last decade concern three main areas: preferential access, trade liberalization and the implications of the Lisbon Treaty for EU foreign policy. First, the accessibility of European products in ACP countries would harm domestic producers in a range of sectors. With regard to exports to the EU, the ACP would have few direct and immediate gains: most ACP countries export mainly minerals and natural resources (petroleum, gold, diamonds and copper) and unprocessed agricultural commodities (coffee and cotton). A second concern the ACP has regarding trade liberalization is the cutting of import tariffs on EU products. ACP countries would lose a huge amount of tariff revenue, which would undermine ACP public budgets. In response, the European Commission tried to propose measures to address the concerns of ACP countries. Europe promised to grant additional finance for ‘aid for trade’. However, this idea has not really been put into practice. EU and ACP countries were unable to agree on the kind of partners to be supported through aid for trade. The negotiations were also difficult for another reason. The EU required the ACP group to negotiate in regional groupings. This undermined the negotiation capacity of the group as a whole. The proposed regions were cutting across existing attempts to promote regionalization with a view to promote trade. Therefore many of the groups lacked the institutions to effectively handle such negotiations. These countries do not always share the same interests either. Some are competitors in terms of their access to the EU, and some even have border conflicts. To complicate matters, the regional groups included both Least Developed Countries (LDCs) and non-LDCs, each of which had different interests. The LDCs enjoy a preferential scheme with special benefits (the so-called ‘Everything but Arms’ initiative, a 2001 EU Council of Ministers regulation that granted duty-free access to imports of all products from LDCs, except arms and ammunitions), while non-LDCs states do not. This has not facilitated a common approach among the regional groups. So the aim of the EPAs – to foster regional integration – may in actual fact complicate matters. The EPAs have highlighted the complexities of regional trade integration and created tensions within potential regional trading groups, making it difficult to move forward. It is no wonder, then, that negotiations were not successful. In fact, they dragged on and on, and the timetable for the negotiations turned out to be too tight. In 2007, a solution was provided in the form of interim EPAs, which were signed by a number of countries. To date, only 36 ACP countries have concluded an interim or alternative arrangement, and only 25 have confirmed their commitment by signing the agreement. Of these 36 countries, 15 are in the Caribbean. This region concluded a trade agreement containing a number of positive elements for the region as well as for the EU. The agreement was important to the EU as it demonstrated that the EPAs were feasible. Moreover, as the first region to sign the agreement, the Caribbean received concessions. This resulted in an acceptable agreement for the 15 Caribbean countries. The negotiation process has essentially been slowed down since 2009, and little progress has been made since. Although meetings are still taking place, a positive outcome is not generally expected. The EPAs seem to have failed in Africa and the Pacific because there is little if any incentive to sign full EPAs. Some ACP countries are now opting for the ‘Everything but Arms’ preferences available for the poorest LDCs, while others are opting for general preference arrangements. The EPA negotiations, seen as being driven by EU interests, have strained the relationship between the EU and the ACP. The new organization of EU institutions also puzzled ACP diplomats. The newly established EEAS no longer includes a department that liaises with the ACP. This is the third problem, namely that a number of changes introduced in the Lisbon Treaty will lead to an external EU policy centred around the EU’s interests or those of individual member states. Before 2010, EU officials dealing with ACP countries reported only to their bosses responsible for development or trade. Today, the policies are far broader and also much more politically motivated. Diplomats with other interests are now looking over the shoulder of EU officials dealing with ACP countries, or are even telling them what to do. The policy plans for developing countries are now drawn up by the EEAS, the EU’s new coordinating foreign service. It may well be that the diplomats talking in the ear of an EU negotiator for the ACP-EU partnership are mainly serving the interest of their own member states instead of the EU. France, the United Kingdom and a few other large member states in the EU supply a substantial number of the diplomats in the EEAS. Given the member states’ involvement in EU external policy, there has been a lot of wheeling and dealing to negotiate which EU member state ‘gets which country’ in the ACP and other regions. It follows that the EU’s external relations will become more politicized and increasingly influenced by the politics in and between member states, especially the largest ones. The EU might, therefore, send French ambassadors to former French colonies, where France still has significant economic interests, or British ambassadors to former British colonies. The European negotiators also have to defend outcomes more often in European Parliament. The entire Common Commercial Policy – comprising trade in services, foreign direct investment and intellectual property rights – which is under exclusive EU competence, is mostly subject to what is called a co-decision procedure between the European Parliament and EU member states. Both have to agree with the proposed policies. This means that more political actors are involved in making deals, so that negotiations become more complex and political, and more democratic scrutiny can be exercised. All of this means that the ACPs engagement with the EU will therefore also require a more explicit political strategy. So like it or not, the new European political position on the ACP will be highly focused on more trade liberalization. The negotiators have no choice, because this new Lisbon Treaty, previously referred to as the European Constitution, explicitly promotes free trade. It states that the aim of the EU’s external action is to ‘encourage the integration of all countries into the world economy, including through the progressive abolition of restrictions on international trade’. Considering that the EU already had a hard time agreeing on rather liberal EPAs with ACP countries, further liberalization may give negotiators on both sides of the table headaches again. If no action is taken to prevent it, the ACP-EU Cotonou agreement will end in 2020. Then what? There are several potential scenarios or combinations of scenarios. First, the agreement could be extended. ACP states would keep their preferential status in EU trade in this scenario. One could argue that the ACP-EU Cotonou Agreement is still the best example of a comprehensive approach to cooperation. It is consistent and fully in compliance with the international normative framework, set out by the international human rights treaties on development that promote partnership with and ownership of developing countries. Moreover, it consciously seeks to implement this framework and is fully in compliance with the aid effectiveness agenda . It provides a model that underpins governance, cooperation and accountability. It provides an overarching legal framework that defines and informs all the cooperation, actions and agreements of the group and its members. Second, the ACP forms an alliance with BRIC countries. The ACP could look beyond Europe and link up with other regions in the world, such as the BRIC countries. In this scenario, the ACP and BRICs follow a strategy that would amplify the North-South divide and create an economic power group based on the G-77 – a group of ‘developing’ nations at the United Nations – with the BRICs as economic and financial motor. This scenario depends heavily on South-South cooperation and the EU’s disengagement with the ACP group. Third, the ACP Group goes global. The increasing impact of globalization and interconnectedness requires new and stronger forms of global governance, in which the ACP group can play an important role. This requires the group to expand its orientation, which would link the new forms of global governance to their citizens’ interests, based on the group’s defining principles and values. As a group of countries that have worked together for a long time within a defined framework, the ACP countries can legitimately represent the interests of a sizeable proportion of the world’s smallest, less powerful and least developed countries. 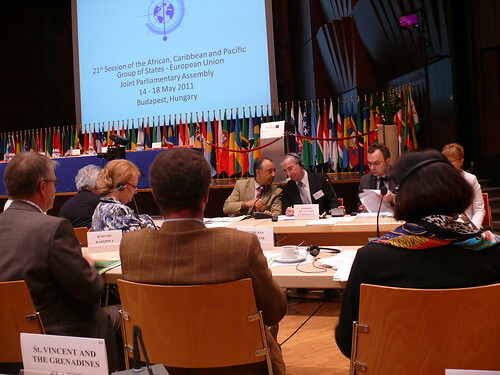 Fourth, the Cotonou Agreement ends, but EU-ACP cooperation continues under a different guise. In this scenario, development cooperation between EU and ACP countries will probably continue despite the fact that the agreement is not renewed. Were the agreement to end, then this kind of aid would no longer be based on a comprehensive and mutually agreed framework. This would potentially undermine the ‘ownership’ of aid programmes in ACP countries and therefore undermine EU ‘aid effectiveness’ as stipulated in the Accra Agenda for Action. The next conference on aid effectiveness will take place in Busan in South Korea in 2011. And finally, the Cotonou Agreement ends, but South- South cooperation is maintained. If the agreement were to end, the 79 ACP countries might encounter problems exporting to the EU. The EU, on the other hand, would stand to lose their access to raw materials and easy access to the growing markets of the APC bloc. The ACP might then evolve into an organization that supports South-South cooperation, and negotiates trade agreements, organizes investments and builds relationships between the group’s own member states. This will help solidify the group’s power base, which will ultimately enable it to represent the world’s marginalized countries and give them a voice in global governance. The ACP has a range of options in terms of future scenarios. And the EU, meanwhile, is facing a choice. Even if it is no longer interested in the ACP (which is already an unlikely assumption), the ACP has a range of possibilities to strengthen its position as a bloc, based on its own internal strengths. Specifically, the ACP Group could claim the position it should rightly have in global governance, as a bloc representing almost half of the world’s nations. The article was originally composed for "The Broker".